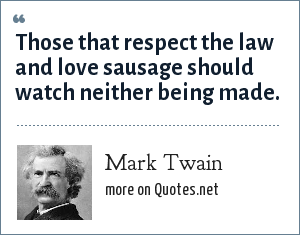 Mark Twain: Those that respect the law and love sausage should watch neither being made. "Mark Twain Quotes." Quotes.net. STANDS4 LLC, 2019. Web. 18 Apr. 2019. <https://www.quotes.net/quote/37076>.